Old PCs often wind up in storage. The personal computer, in the age of handheld devices and smartphones that let you take professional-grade photographs, seem positively antiquated—and they are. 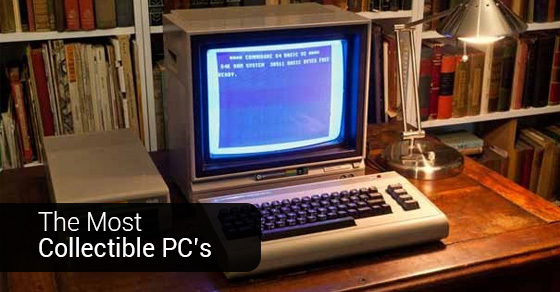 But, that doesn’t mean that your old PC isn’t an important—and valuable—piece of history. Below are some of the most collectible PCs, ones that you should definitely hang onto if you’ve got them. Made by Xerox in 1973, there were only a couple thousand of these units made. The computer industry is still obsessed about the technological ingenuity of the Alto, including its sophisticated graphical user interface and laser printer. The market value of this piece of history sits somewhere between five and ten thousand dollars. Even those who aren’t PC aficionados have probably heard of the pioneering Apple 1. Released in 1976, only a few hundred of these units were released, with an original price tag of just under $670. Nowadays, if you find yourself with one of these on your hands, you could be looking at a market value of somewhere in the range of 15 to 25 thousand dollars. The sequel to the Apple 1, the Apple 2 sold a great deal more units than its predecessor—around 5 or 6 million— with an original sale price of $1,298. Because there were many more units sold, the value placed on it by collectors is considerably less, but still nothing to turn your nose up at. If you have one of these around, it may be worth anywhere from $15 to $250, depending on the condition it is in. Released in 1982, the Commodore 64 has been labelled the bestselling single computer model ever made. It sold nearly 17 million units, with an original market price of $595. Again, depending on the condition you find yours in, you could get anything from $10 to $300 for your old commodore. The Cray-1, created by Cray Research in 1976, only ever sold around 80 units, making it a very rare piece of technology that is sought after by collectors. This massive piece of technology was sold for a whopping 5-million dollars when it first hit the market and if you find yourself with one of these on your hands (though it’s unlikely), it could potentially be worth tens of thousands of dollars. It’s always a good idea to know the value of the things you have in storage, and especially wise to know these details before you decide to throw away, recycle or donate something. If you have old PCs sitting in self-storage that you are unsure about, do some quick research and find out if it might be one of the above 5 PC jewels.